I made these tasty cookies for my Dad's birthday. Happy Birthday Dad! No, I did not present them to my Dad with this cute red ribbon. I dressed them up a little more "manly"...in a glad ware container with a blue lid. I did tie a thick blue ribbon around the container for a little pizazz. I couldn't resist. These cookies start with a chocolate chip cookie base and have white chocolate chips, semi-sweet chocolate chips, toasted almonds, almond and vanilla extracts and dried cherries added in. All the mixins make for a nice chunky cookie. The almonds add a nice crunch and pair well with the cherries. 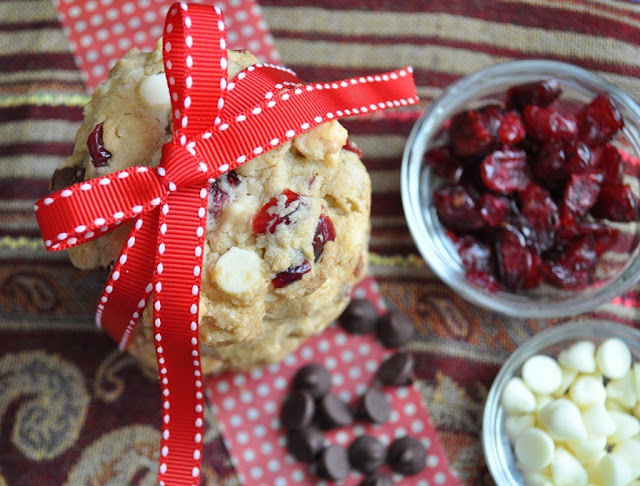 The tartness of the cherries bring balance to the sweetness of the white chocolate chips. All said and done, a pretty solid cookie. Even though these cookies were for Dad, I couldn't resist dressing them up for fun photo shoot. Over the last several months I have been making a conscious effort to improve my photos. I have a nice camera, a Nikon D-5000, but I can't say I really know what to do with it. I know I am "supposed" to use the manual settings and figure out F stops and apertures and stuff like that, but instead I usually just switch my camera to the "Food" setting mode. That, along with shooting most things on the kitchen counter during daylight hours where a window lets in natural light, is about all I do. For the most part it works pretty well....but I think it can only take me so far. That is why I am over the moon excited that I won a spot to participate in the White on Rice Couple's photography workshop in mid October courtesy of Food Gawker! Todd and Diane of the White on Rice Couple offered 10 11 spots in an all day photography and food styling workshop in their brand new studio to raise money for a Fund for Jennie. Their workshop sold out in no time and they raised an astounding $11,000 for Jennie. A truly generous gift and a great cause. Food Gawker helped support the cause by securing one of the spots in the workshop and held a giveaway on their site last week. I entered my comment for a chance to win, thinking maybe, just maybe, I would be the lucky one. (I also think that for every other giveaway I enter (but don't win)). The giveaway stated that you must be able to get yourself to and from Orange County, California. Guess who lives in Orange County? Me! I do! Low and behold, on September 7th (which also happens to be my Dad's birthday) I received an email from founder of Food Gawker, Chuck Lai, telling me I was the winner! Holy smokes! Really?? I couldn't believe it. I was smiling from ear to ear. I found out when I was at work and resisted every urge to get up a do a little dance at my desk. But I might have done a little dance in my chair. Ok I did. But no one was around. Anyway, Dad and I both had a good day on September 7th! I cannot thank Chuck Lai and Todd and Diane enough for their generosity and this fabulous opportunity. If you haven't heard Jennie's story, it's a sad one. Jennie is a food blogger, writer and mother of two little girls. I didn't know Jennie, but I've come to learn a lot about her over the last few weeks. My first encounter with Jennie was when I saw this peanut butter pie over on the Brown Eyed Baker on August 12th. That same day, I started seeing peanut butter pies all over different blogs. Not just one or 2, more like 20 plus pies. And that is just on the blogs I follow. The pies were made for Jennie's husband, Mikey, who unexpectedly passed away on August 7th of a heart attack. Jennie shared the pie on her blog and invited people to make this pie in honor of her husband and all post on Friday, August 12th, the day his family would be celebrating his life. It was completely moving to see the out pour of support for Jennie during such a tragic time. I cannot imagine what Jennie must be going through. She is sharing her thoughts on her blog, In Jennie's Kitchen, as she tries to come to terms with the loss of the love of her life. I have been following her blog and the posts are touching and heart wrenching all at the same time. Definitely keep your tissue box nearby. The food blogging community took their support to the next level by starting a fundraising effort for Jennie. Non profit organization Bloggers Without Borders (BWOB) started A Fund for Jennie with a goal of raising $25,000. Little did they know they should have gone bigger! In just a couple of short weeks, BWOB raised over $63,000 for Jennie. Pretty amazing. To read more about the project and Jennie's story, click here. Now, go kiss and hug your loved ones. 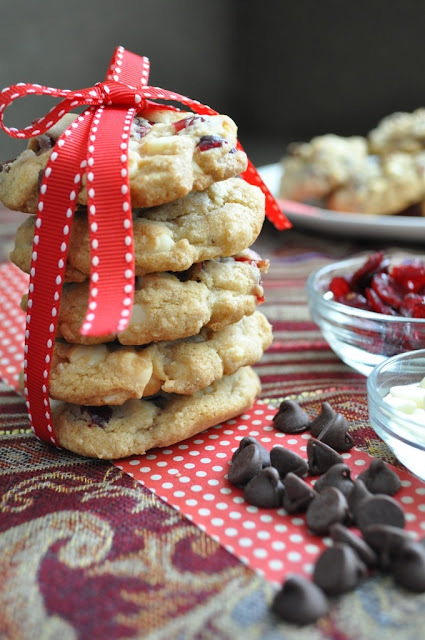 And make them a peanut butter pie or these cherry chocolate chip cookies to celebrate family, love and life. To soften your butter quickly, place the butter in a microwave proof bowl and heat for 1 minute at power 2. You want your butter to be soft, but not melted. Test your butter and if it's not soft microwave in 30 second blasts at power of 2. Get out your measuring cups, spoons, a whisk and a rubber spatula, cookie scoop or two spoons to drop cookie dough onto the baking sheets. Heat a small non stick skillet on medium and add slivered almonds to the dry pan. Stir almonds frequently to prevent burning and cook about 5 minutes or until almonds are lightly golden. Preheat oven to 375 and line two baking sheets with parchment paper and set aside. In a small bowl whisk together flour, baking soda and salt together and set aside. Get out your egg, butter, almond and vanilla extracts. Measure out cherries, chocolate chips and set aside. In stand mixer fitted with a paddle attachment or using a hand mixer, mix butter and sugars together on medium speed for 2 minutes until light and fluffy. Turn mixer to low and add the egg, almond and vanilla extracts until just combined. With mixer on low speed slowly add the flour mixture until just combined. Stop mixer and add dried cherries, white chocolate chips, semi-sweet chocolate chips and slivered almonds. Turn mixer on low until all ingredients are thoroughly combined. Using a medium scoop (about 1 1/2 tablespoons) scoop out dough placing about 2 inches apart on the baking sheet. Use your hand to press down on the dough and flatten the cookie slightly. Bake for 10-12 minutes or until cookies are very lightly golden brown on top. Cool on cookie sheets for 10 minutes and transfer to a wire rack to cool completely. Your camera has a food mode?? Wow, that's pretty awesome! I'm so excited for you to have won a spot in the workshop, hope you'll tell us all about your experience afterward. Also, can I tell you how excited I am to see your photos on FoodGawker lately? So deserved, congrats girl! Those cookies look awesome! A huge congratulations on winning the giveaway! I really wish I knew how to use my camera. Thank you Tracey and Margot! :) You guys are the best! Too bad we live on opposite sides of the country Tracey and opposite sides of the state Margot. Would love to meet you all in person sometime. These cookies look delish! I love the cherries and white chocolate!